This past week has been the kind of week that slaps you in the face, trips you while you’re eating a waffle cone dripping with a scoop of your favorite flavor of ice cream… then hands you an ice pack and buys you two scoops to make up for all of the drama… and then takes one of the scoops and hits you in the face with it. Feel me? So, I wrote a piece for Bustle that I hope ya’ll check out. It’s my first published piece on a major website, and it’s full of references to my hometown, Queens, NY. So many people have already shared the piece and said tons of kind words about it (that would be the “ice pack and two scoops” portion of the week) that it has built my crap self-esteem back up, ever so slightly. I could not be more grateful, especially given that the first thing I’ve ever written that’s gotten some real attention is about a place that is very near and dear to me. Thank you to everyone who read/does read it. And now, onward! Onward on so many things, I hope. I’m coming close to turning 28, and I think this is probably the first time in my life where I’m all “Oh. I am turning a new age. This new age feels a little bit weird to me. Twenty eight. Two, eight. Huh.” Maybe I’m finally coming to terms with my own mortality? Doubtful. I think even-numbered years just weird me out (don’t ask, it’s an incredibly strange story), and this is the last even-numbered year I’ll have before I turn 30. And it’s not that I’m terribly scared of turning 30, I think I just assumed I’d have more accomplished by then. More published pieces, more friends, a house, fat children, a dream role co-starring with Mark-Paul Gosselaar in… something or other. But you’ve all heard this from me before. Perhaps you’ve even had similar freakouts and understand where I’m coming from. There’s a huge part of me– one that’s hung around for far too long lately– that has sort of wanted to retreat from the world until I figure myself out. I can feel myself thinking things like “just give me a couple more weeks, maybe years. Then I’ll finally open myself up to people. I’ll get it right! I’ll be back to my old self!” And I guess that’s palpable. I’ve just never learned how to not go through things alone, and I’m starting to wonder how sustainable my current method of [not] coping with life is, without a little help from some friends. So, welcome to my drama, guys. Bust out the popcorn. Better yet, bust out the popcorn pudding. Yes, I said it. Popcorn. Pudding. 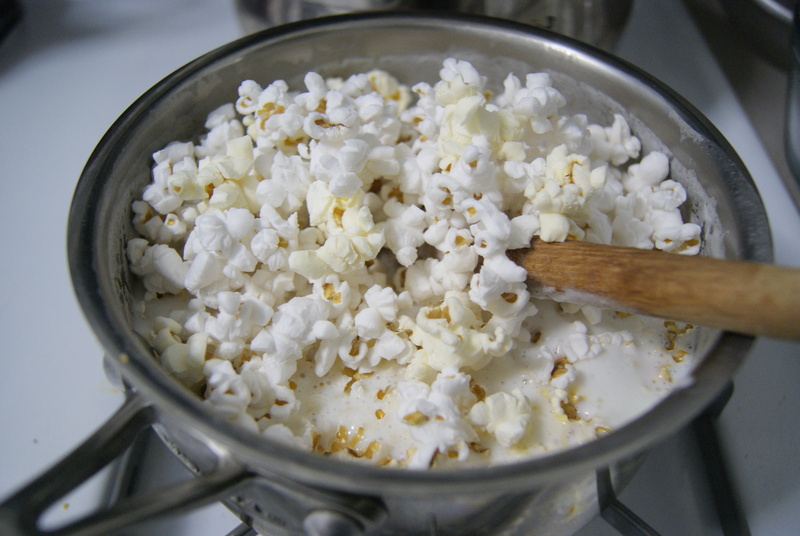 To start, if you don’t have a popcorn maker, you can heat 1 tablespoon of vegetable oil in a medium-sized pot over moderate heat. Add your kernels and cover the pot. 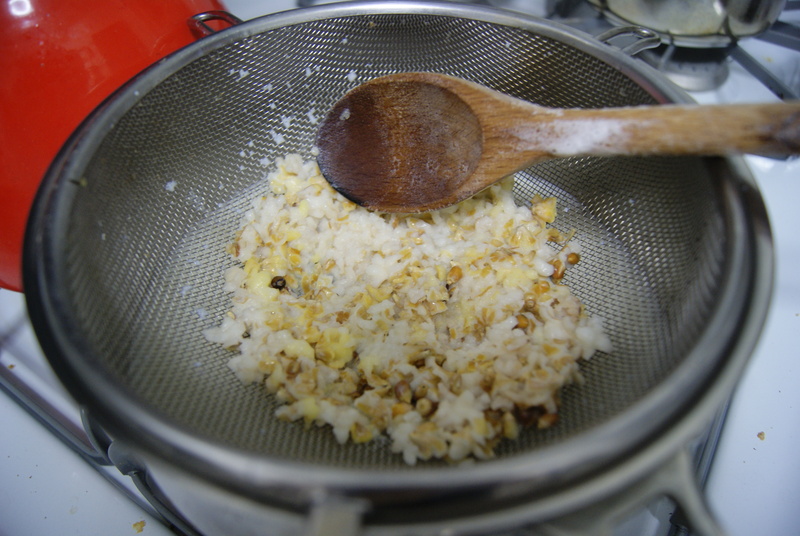 Once the kernels start popping, gently shake the pot until the popping has stopped, which should take about three minutes. Set aside. Now, in a separate large pot, combine milk, cream, sugar and salt over moderate heat. Cook until the mixture boils, continuously stirring in order to dissolve the sugar. Stir all but 1 cup (set aside this cup– we’ll use it later) of the popcorn into the mixture, then cover and let stand for about 10 minutes. In a medium-sized bowl (yep, lots of dishes here, folks), whisk egg yolks and cornstarch until combined. 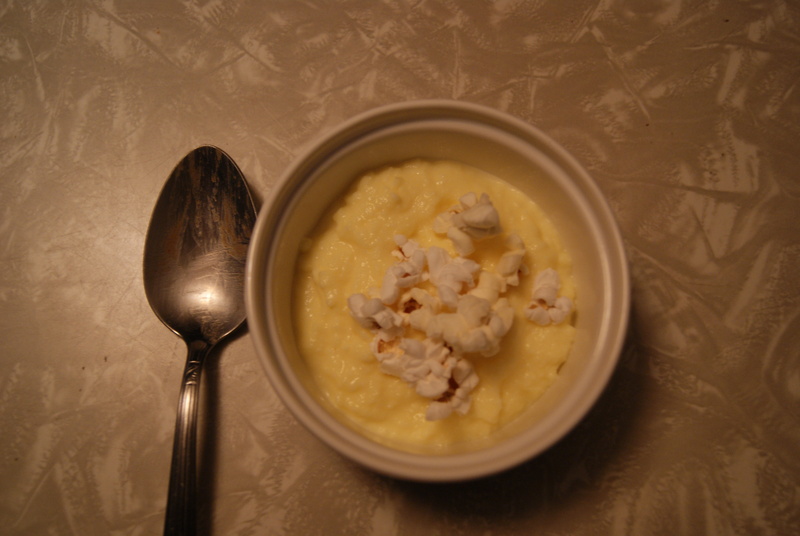 Strain out the cream/popcorn mixture into a new pot, pressing gently to release remaining liquid. Dispose of the remaining solids. Bring cream to boil over medium heat. 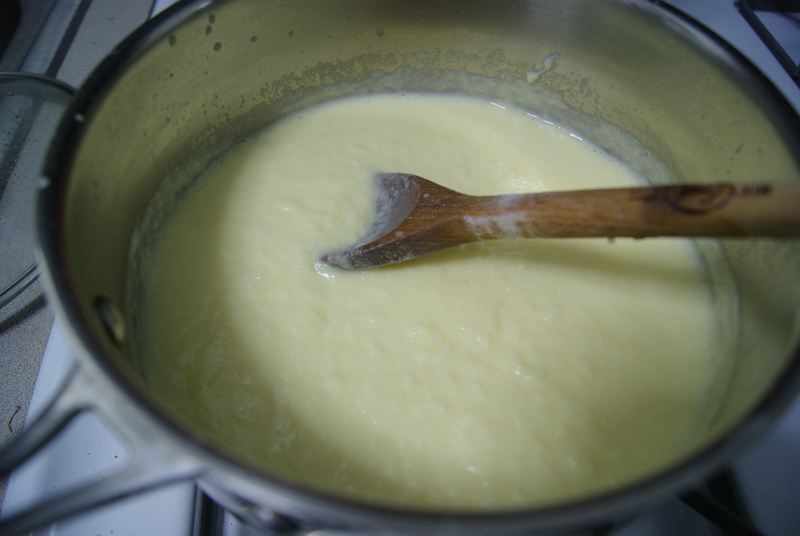 Remove from heat and slowly whisk 1 cup of cream mixture into yolk mixture. Pour this back into the saucepan. Now, over moderate heat, whisk the mixture just until it thickens and comes to a boil. Remove from heat again, and stir in butter and vanilla. Transfer mixture to a baking dish, cover and chill for at least three hours. Serve with remaining popcorn as garnish. It may not look like much, but… holy crap. HOW does it taste so much like popcorn?! I mean, I get it, the whole thing was soaked in popcorn goodness for like ten minutes, but still. That’s CRAZY. If you’re a fan of popcorn, you will love this. If you’re a fan of Jelly Belly popcorn beans, you will love this. If you think Jelly Belly popcorn beans are disgusting… you will still love this. I’m totally serious. It’s sweet and salty (especially if you sprinkle a tiny pinch of salt on top before serving, like I did) and very, very fun. My boyfriend was so amazed by this that he quizzed me constantly about how it was made (“Popcorn extract? Some sort of sorcery? DID YOU DRUG ME?”), and I would like to say that I told him to wait until the blog was up. But, it got annoying so I told him after about an hour. However, if you have more resolve than I do, and more friends than I do, you can totally serve this up to all of them and keep your lips zipped as to how this masterpiece was made.